For my card today, I wanted to really keep the card simple and show lots of white spaces. Very simple and super easy to reproduce if needed to be. I would never have thought to use that stamp the way you did! Makes an every day tree into a holiday tree, super cool! Beautiful card, love how the outside and inside match!! Love the tree stamped in white and embossed! Perfect for winter! 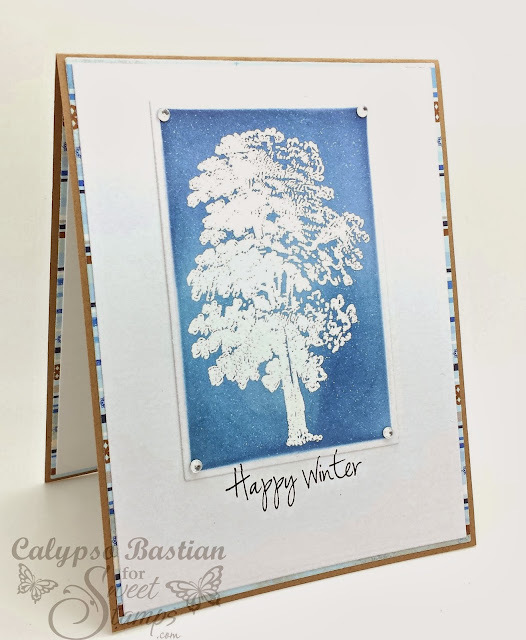 Calypso, I love the tree embossed in white!! What a fabulous idea for a winter tree!! Great idea!! Just beautiful! I love the look of the snow covered trees- and the blue BG os perfect- loving the background and that you finished the inside as well! Calypso, what a wonderful idea! Your card is so gorgeous! I love you shading and that Bling on the corners just finish it off all so lovely!! This is a beautiful design Calypso, but our challenge is actually Winter FUN, not just winter. Hi Calypso, yes it turned out really great. Love this style it is all the time very elegant. Your boo boo fix worked perfectly, Calypso! This is so beautiful. I really love the blue/white setting for this tree. Fabulous *simple* card. Das ist wirklich wundervoll geworden. Love the simple design of the embossed tree on the blue, it has an elegant feel to it. Beautiful!! Beautiful card, the white tree really stands out on the blue background. Gorgeous card! Thank you for joining us at Cards und more.